November 2013 is likely to be remembered as the worst month of Barack Obama's presidency, that is, if he's lucky enough to stop the bleeding over the course of the next few weeks. Republicans, fresh off of what was perceived at the time as a historic misstep in shutting down the federal government to defund the Affordable Care Act, were handed a life-line with the disastrous healthcare.gov rollout, followed by nationwide cancellations of millions of people's health insurance. What came next was predictable. The President's numbers remained steadily negative up until late last month, when they turned steeply southward. The last non-daily tracking poll to find the President in single-digit negative territory was a GWU/Battleground poll from one month ago. No less than 6 separate surveys taken this month have shown his approval rating in the 30% range. And a recent CBS/NYT poll gave Obama the worst job approval rating of his presidency, in *any* poll. Making things more difficult for the White House, a flurry of state polls indicate negative impressions of the President's job performance have filtered down to the states. With relatively few exceptions, the President's numbers are quite poor, especially when compared to his performance against Mitt Romney in last year's general election. And when considering JUST the numbers taken over about the last two weeks, the picture gets even more grim, especially with respect to five swing-states with high profile Senate or Gubernatorial races in 2014: Colorado, Iowa, North Carolina, Florida, and Ohio. 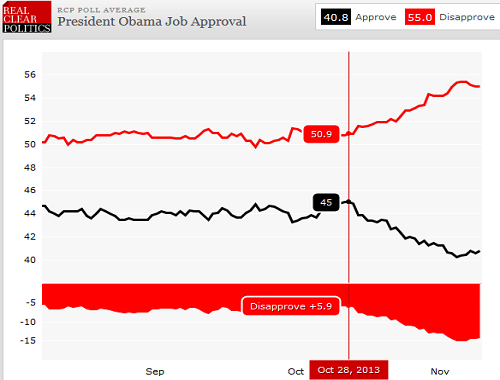 What does a term-limited President's job approval rating have to do with Democrat's chances in 2014? Sean Trend of Real Clear Politics recently concluded that, at least from an aggregate, national perspective, it matters a lot. But what kind of correlation, if any, is there between a President's state-based job approval rating, and that particular state's Senate or Gubernatorial midterm result? On the more micro level, the relationship between presidential approval and his or her party's midterm result gets murkier. Hillary Clinton and Chris Christie would stand a fair chance of winning their party's nomination if Republicans and Democrats decided on a nationwide basis at the ballot box today. But then again, so would General Colin Powell at a similar point in 1997, and Senator Edward Kennedy in 1981. Unfortunately for them, that's not how the party's pick their nominees. As discussed in part 1 of this series, there have only been three instances in the last forty years of presidential primary polling in which the frontrunner in the first year following the preceding election went on to win his party's nomination. Clinton and Christie can't like those odds. But about 80% of the time, or three out of the last fifteen primaries, early surveys were unreflective of final results. The twelve Republican or Democratic primaries since 1976 to feature non-predictive early primary polling split roughly into two groups - 1) those where the eventual nominee showed up in early surveys, but not as the frontrunner (as discussed in Part 2 and 3 of this series), and 2) those where the eventual nominee seems to have come from nowhere, emerging in much later polling, sometimes after primary contests have begun. This fourth installment will continue to focus on group one above...namely the 2008 Republican and 1980 Democratic Presidential Primaries. 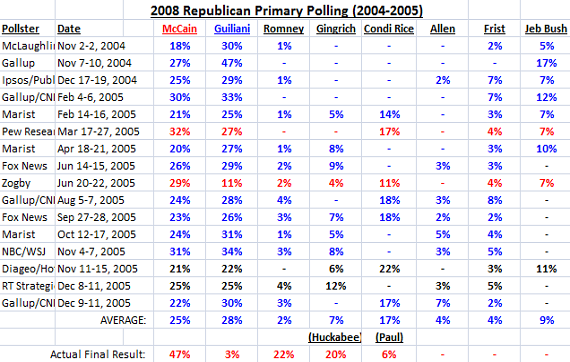 Across sixteen surveys in the first year following the 2004 presidential election, Giuliani led likely GOP foes in twelve of them, tied for first place in two, and finished a close second place in the remaining two. The wealth of 2016 polling, of both the general election and primary sort, led veteran news journalist Tom Brokaw to quip yesterday morning on "Meet the Press": "We have an hour to fill." Los Angeles Times writer Mark Barabak recently dedicated an entire column to their futility. And the mere existence of a recent NBC/WSJ poll on the 2016 general election practically ruined NPR reporter Don Gonyea's breakfast last week. Overly dramatic or not, many of the talking heads looking down on early 2016 polling, at least on the primary level, are justified in their skepticism. Early presidential primary polling, especially those taken the first year following the preceding presidential election, are historically unreliable. In fact, only 3 of the last 15 Republican or Democratic primaries saw the leader in very early polling go on to win the nomination (as noted in parts one and two of this series). To be fair, as Nate Silver has noted in the past, presidential primary polling accuracy rises sharply following midterm elections. But surveys conducted between the preceding general election and the midterms accurately forecasted the eventual nominee for just three people: Al Gore in 2000, Bob Dole in 1996, and George H.W. Bush in 1988. Part 2 of this series began exploring those primaries where the eventual winner was on the polling radar very early in the process, but was not the initial leader (such as the case with George W. Bush in 2000). In this third installment, I'll continue in the same vein by looking at 1984 Democratic Primary Polling conducted between November 4, 1980 and December 31, 1982. 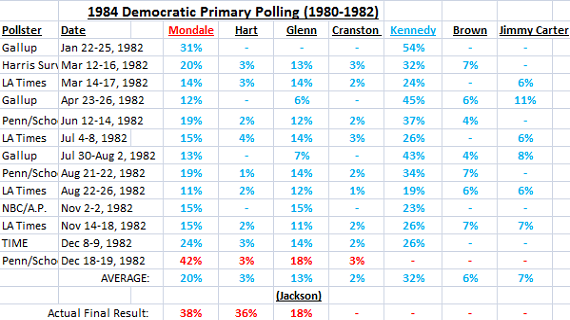 Like in 2000, the eventual nominee (Walter Mondale) showed up in early polling, just not as a frontrunner. That title belonged to Edward Kennedy. Elizabeth Dole polled a closer 2nd place to George W. Bush in 2000 Republican Primary polling than John McCain ever did. This is a continuation of a piece I wrote last week that examines the last 40 years of Republican and Democratic presidential primaries in an attempt to understand the predictive value of polls taken two to three years before the start of actual primary contests. Just before the 2012 race, Nate Silver looked at whether polls taken ONE year before the Iowa Caucuses presaged the eventual nominee, and found that yes, in many instances, they do. This series will look back even further, before the ink dries on your just-cast presidential ballot, to see if polls did as well further out from the primary race. Not surprisingly, the answer is no. As discussed yesterday, very early primary polling had predictive value as to the final result in just three of the fifteen Republican and/or Democratic primaries examined dating back to 1976 (the 2000 Democratic and 1988 & 1996 Republican presidential primaries). 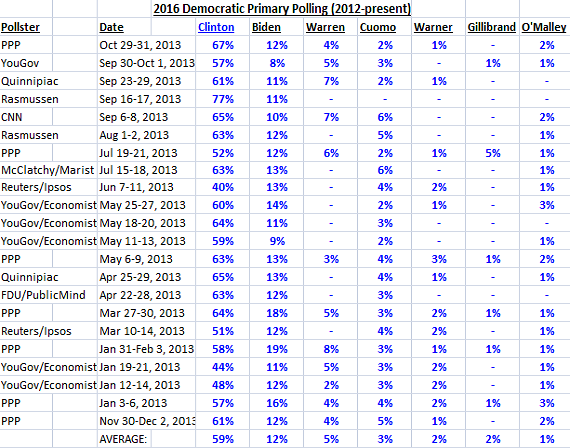 But excluding those three contests, very early primary polling has been unhelpful in identifying eventual nominees. 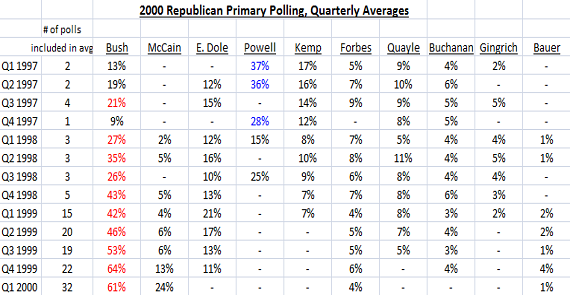 One of the best examples of early primary polling's failure at political forecasting is the 2000 Republican contest. Contrary to how it may seem, the massive lead that eventual winner George W. Bush commanded for most of the primary season did not exist in 1997, the first year of Clinton's second term, before any layperson had heard the name Monica Lewinsky, and before Bush had been overwhelmingly re-elected to the Texas Governorship. That was thanks to a very popular African American General, Colin Powell. Powell surprised observers early in the '96 cycle with impressive, hypothetical head-to-head performances against President Clinton (even leading him by double digit margins on multiple occasions.) So you can understand why, following a disappointing presidential loss, 35% of Republican primary voters were willing to support him as their candidate for President in 2000. So Powell exited the race on a high note. With the exception of 1997, the 2000 GOP primary process closely mirrored the three I discussed yesterday - Bush positively dominated polls throughout 1998, 1999, & 2000. Senator John McCain, despite the media excitement he created following his New Hampshire win, never seriously threatened Bush from a national polling perspective. In a Gallup survey taken prior to the February 1st NH primary, McCain managed just 15% in a national poll of Republicans, vs. Bush's 65%. After the NH primary, the lead was a considerably smaller, but still daunting 56-34%. That Gallup finding also represented John McCain's national peak, as it was downhill from then until his official exit on March 10, 2000. 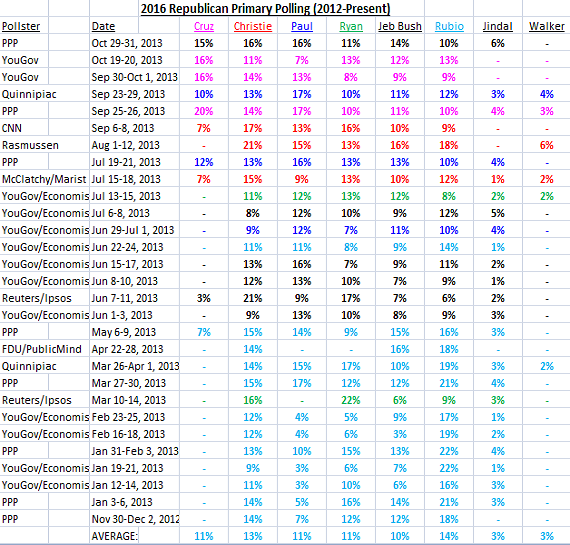 Out of 131 total 2000 GOP Primary surveys taken, Bush led in all but five. But traveling back in time to 1997, no one could have foreseen that based off polling alone. Fun facts: Outside of Colin Powell, former Secretary of Labor, N.C. Senator, and would-be First Lady Elizabeth Dole was Bush's strongest polling foe in 2000 primary surveys (even more so than John McCain), trailing him by as little as 9 points in a February 1999 Fox News Poll of Republicans. Colin Powell was grabbing headlines as a potential candidate for President in 1996 as early as 1993. Though he never actually led Dole in primary polling until just before he announced he would not be a candidate in November of 1995. Though the 2016 presidential primaries won't officially get under way for another two years, the shadow campaign is upon us, as indicated by the flourish of recent polls and articles on the subject. And the tea leaves for both parties couldn't be more different; for Democrats, the race appears to be Hillary's to take - if she wants it, while the Republican race is anyone's guess. Hillary Clinton, should she decide to run, looks poised to wrap up the Democratic nomination in one fell swoop, as early polling has shown her very strong in the Democratic primary - stronger, in fact, than any candidate in a contested primary dating back to 1976. In spite of the deluge of early primary surveys since last year's election, there are many who find the early speculation premature at best, or entirely futile at worst. “But early primary polling isn’t predictive of actual primary results!” is a frequent refrain for the many that abhor such early conjecture about an election that’s still three years away. So in an attempt to settle the issue, I decided to take a look at the predictive power of Democratic and Republican Presidential primary polling from 1976-2012. And there were more than a few surprises. Note, Nate Silver did something similar a few years ago, though if you click on the link, you'll see his focus was on polling one-year out from the start of actual primary contests. This piece will examine the predictive power of those polls two and three-years out from the start of the contests (where such polling data is available).